516, on the Missouri Pacific Railroad, five miles east of Pecos in southwestern Ward County. The town was named for George E. Barstow, a Rhode Island land promoter who established it. The Texas and Pacific Railway reached Barstow in 1881. Ten years later the town site was laid out and a post office established. Barstow became the county seat when Ward County was organized in 1892. That same year George E. Barstow formed the Barstow Improvement Company to promote the sale of land irrigated by the Pecos River. He constructed irrigation canals and a dam and brought train loads of prospective settlers to the town in land promotions. 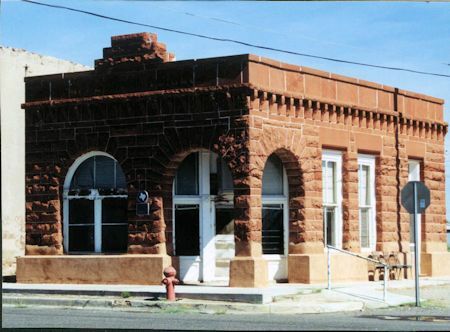 A red sandstone courthouse was constructed in 1893. The courthouse was constructed from stoned quarry at nearby Quito quarry. Stone for this quarry was used to build the first courthouse in nearby Ector County in 1884 and the nationally recognized Ellis County courthouse in Waxahachie, Texas and many other public and private buildings in the late 19th century. The farms around Barstow grew grapes, peaches, pears, and melons. In 1904 the Barstow Irrigation Company won a silver medal for grapes at the World's Fair. The same year an earthen dam on the rain-swollen Pecos River burst, and the resulting floodwaters raised soil salinity levels, thus ruining many of the farms. In June 1938, after the discovery of oil in Winkler County and eastern Ward County, Monahans replaced Barstow as the county seat of Ward County. 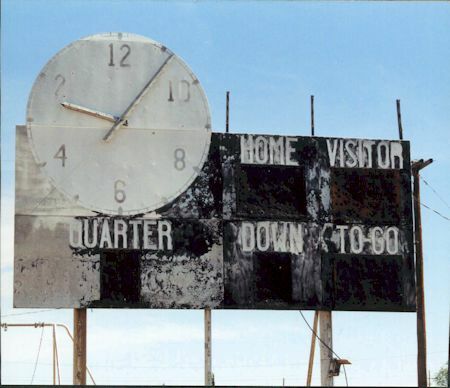 "Old football score board. If it could only talk"